NewTek Connect Spark™ can grow in capability as NewTek advances NDI®, the royalty-free bi-directional IP technology for transporting media, metadata and communications over standard network technology. Users will therefore want to be familiar with how to update the firmware on board so they can take advantage of these advances as they come along. On this page you will find the links to download new firmware when it is issued, updated User Guides, and the NDIHX driver that is needed to let a computer system access and control the Connect Spark. In addition there are useful support links to the Online Knowledge Base for Customer Support, the NewTek User Forums, and Chat Support. 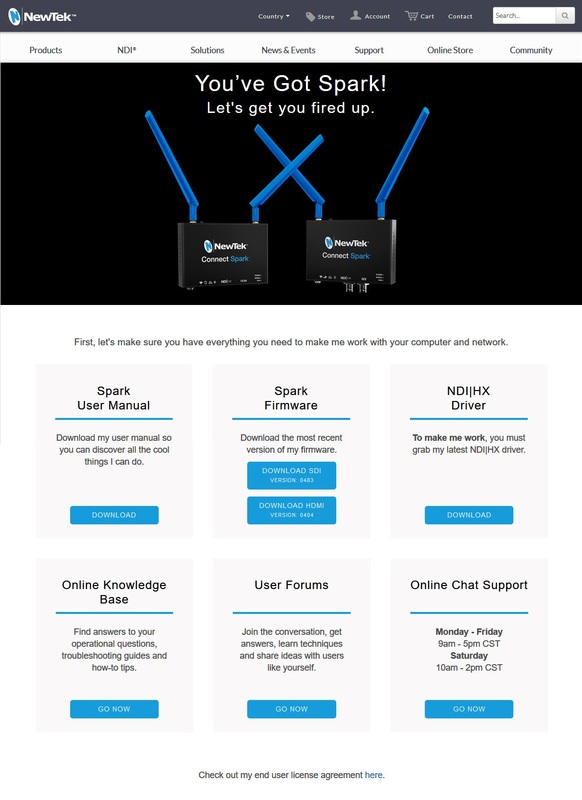 The NewTek Connect Spark User Guide also contains the complete steps to update the firmware, should you need some additional reference material. Important Note: When you set up your NewTek Connect Spark for the first time, plug in an Ethernet connection first, then connect power and turn the unit on. This will ensure that Spark obtains a proper network address from your DHCP server; when it does not do so on power up, Spark fails over to a static IP address, and that may conflict with your local network. NewTek Connect Spark Downloads Page.